Steven Gerrard has pledged to return to Liverpool because he feels he has a contribution to make to the club in the future. The 34-year-old is enjoying a post-season break before he begins a new challenge in Major League Soccer with Los Angeles Galaxy this summer. But after 710 appearances in a 17-year professional career at Anfield, Gerrard has his sights set on coming back. 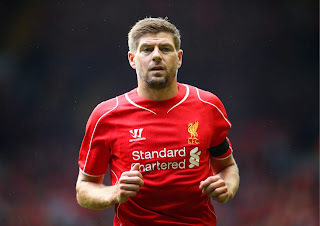 Gerrard has been captain for more than a decade and led from the front in most of the club’s recent successes, most famously the comeback against Milan to win the Champions League in 2005. However, this season he has not featured as regularly as he would have liked and that persuaded him a move to the United States would help prolong his playing career despite a contract offer coming in late from the Reds. “I want to keep playing every week in the final few years of my career and I’m looking forward to embarking on a new challenge with Los Angeles Galaxy in the MLS,” he added. “It’s been an absolute privilege to represent this football club for so long. It’s been very humbling and it’s something I’ll cherish for the rest of my life.